Toki Tori 3D arrived today on the Nintendo 3DS eShop. 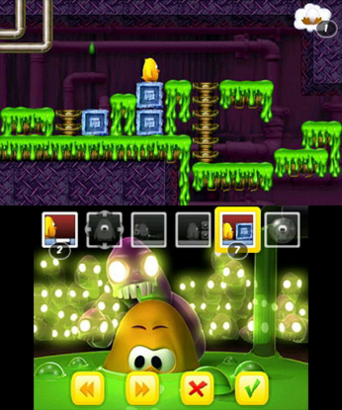 The game is based on the Gameboy Color classic, Toki Tori. It also brings with it some new features and content, while fixing some of the problems of the original game. 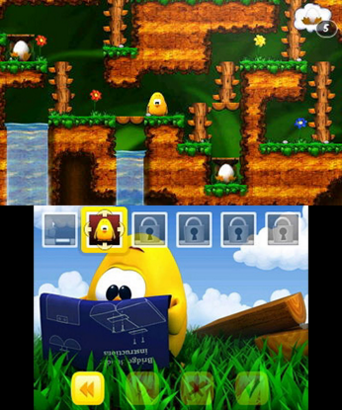 There are over 80 levels that span 4 different worlds for Toki Tori to get through. 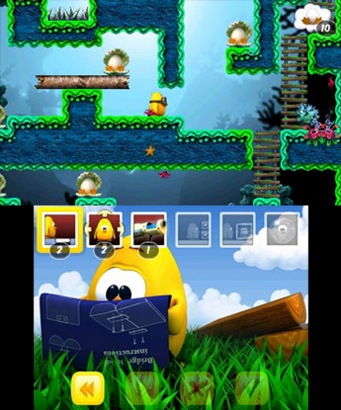 While Toki Tori 3D looks like a platformer at first glance, it is actually a puzzle platformer. Can Toki Tori solve the many puzzles that lie before him, or will they defeat him? Either way, Toki Tori 3D is available on the Nintendo 3DS eShop for a price of $1.99 / €1.99, having launched simultaneously in the Americas, Europe, and Oceana today. 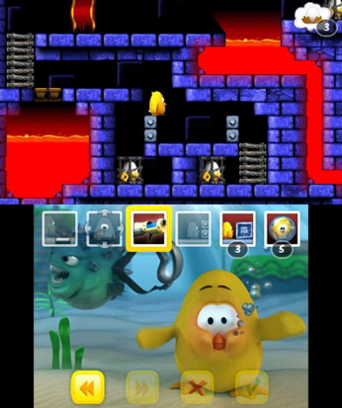 The screenshots below show Toki Tori 3D on the left, and Toki Tori for Gameboy Color on the right. You can see that Toki Tori 3D‘s graphics are quite a bit more detailed than the original game, and a bit more brightly colored. I can tell you from experience that the Toki Tori games are very charming little puzzle platformers, but they can also be plenty tricky. Cartoony doesn’t always mean super easy! Toki Tori 3D is designed to be played by people of all ages, but there are hard levels available as well for those wanting more of a challenge. Items are gradually introduced as the player advances through the game, increasing your arsenal of tools. If you like puzzle games, or puzzle platformers with cute graphical styles, you should probably check this one out. 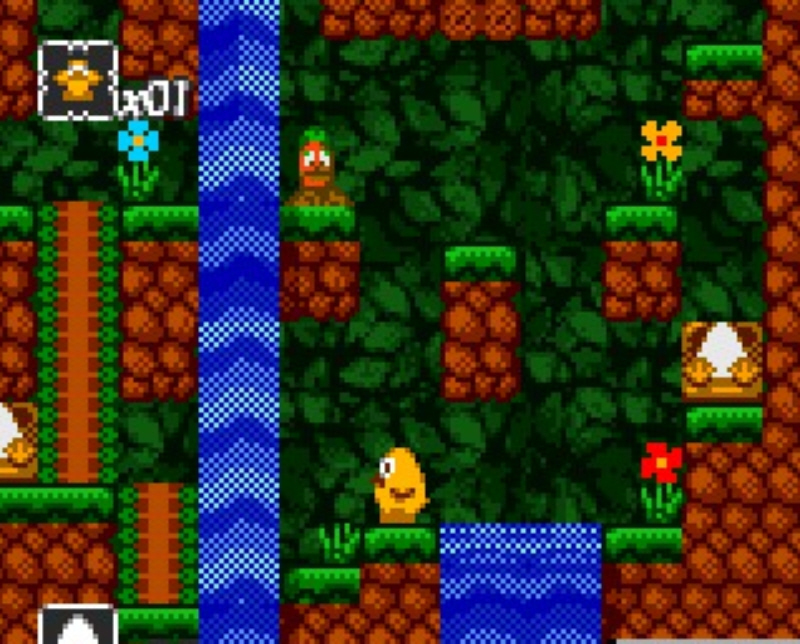 You can also check out our review of another iteration of Toki Tori that was also based on the 2001 Gameboy Color game (this one launched on PC and a number of other platforms) by clicking here. Over the years, Toki Tori games have hit a number of systems, including PC and Steam, as well as other platforms like the Wii U. And lastly, here are a few more screenshots of the game in action.